Freshness, an irresistible colour palette, a triumph of lightness that explodes in a deluge of nets and pastel shades. Spring 2019 trends are an ode to femininity, in its simplest and most elegant version. The most stylish new colour is beige in its various gradations: neutral combinations and rigorous tone-on-tone matches prevail in the season that has just blossomed. Like in Metal Plissé – a Schmid’s evergreen product – an elasticized technical fabric that is just perfect for ready-to-wear creations, or in Sweet Dreams, a shining laser treatment applied to satin embellished with regular geometric shapes. Ample room is given also to pastel shades: pink, light blue, lilac and typically spring colours, which always feature in women’s accessories collections. Extremely light colours characterise Nylon Ripstop, featuring threads that are intertwined at regular intervals on a cross background, making it resistant to tearing. And, lastly, let’s dive… into fishing nets. Many clothes and accessories are inspired by the fishing world. 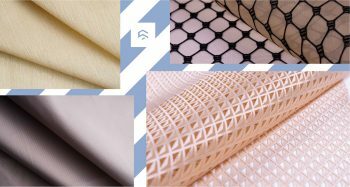 And Schmid offers fabrics that are just perfect for this theme: such as Filet, an open weave lace coupled with a modern net featuring marine-like knots. Let yourself be fascinated by our creations. To find out more about their characteristics and properties, you just need to contact us.